How do people find what they’re looking for on the web? And in order for business owners to ensure that their content appears as the most relevant resource for prospective customers, they must optimize web pages to show up in search engine results for specific keywords. But let’s say you’re a beginner when it comes to search engine optimization (SEO). With help from our friends at The Draw Shop, we whipped up 12 definitions from our new Content Marketing Glossary into short, fun whiteboard animated videos. SEO stands for “search engine optimization.” It’s a process of getting traffic from the “free,” “organic,” or “natural” search results generated by search engines. Google and Bing are the biggest search engines, and they use algorithms to examine the content on a given page in order to decide what that page is about. Then, based upon more than 200 factors, they decide how relevant that page is to certain keywords. How far is the earth from the sun? Who is the lead singer of Led Zeppelin? Those questions contain keywords. The more your content matches those questions, the better the experience for the user. When you make people happy, you make Google happy. Click here to check out this definition on YouTube and share it with your audience. 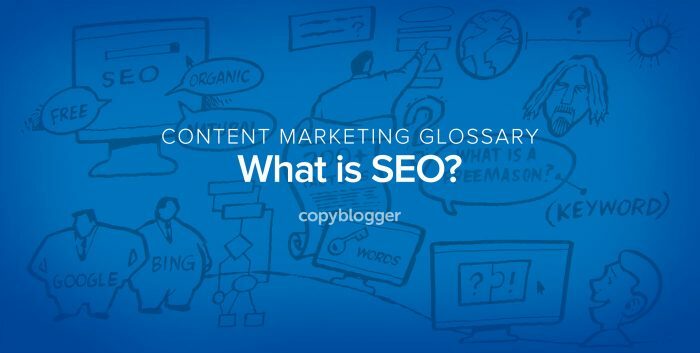 You’ll also find 11 additional Content Marketing Glossary videos. Ready to master content marketing essentials? Watch all of our animated whiteboard videos right now by going directly to the Content Marketing Glossary. By the way, let us know if there are any definitions you’d like us to add to the glossary! Just drop your responses in the comments below. The post SEO Defined in 60 Seconds [Animated Video] appeared first on Copyblogger. Ever find yourself in a conversation with your boss or a client and she mentions implementing marketing automation? Did you understand her request, or did the conversation grind to a halt because you’re not familiar with the term? If you fall into the second category, you’re not alone. Marketing automation is a hot topic these days, and its popularity has grown rapidly since 2013, but it can be tricky to define. What exactly is marketing automation? Marketing automation refers to software used by people and companies to streamline, automate, and measure marketing workflows by automating repetitive marketing tasks. In other words, it performs certain manual marketing tasks for you. Night and day. Rain or shine. Imagine someone downloads one of your ebooks. Marketing automation software will capture the contact information from the form, segment that lead based upon the information it gathered, and then send them an appropriate series of emails over a prescribed time. We’ll feature the rest of the videos soon, but if you’d prefer not to wait, you can watch all the videos now by going directly to the Content Marketing Glossary. 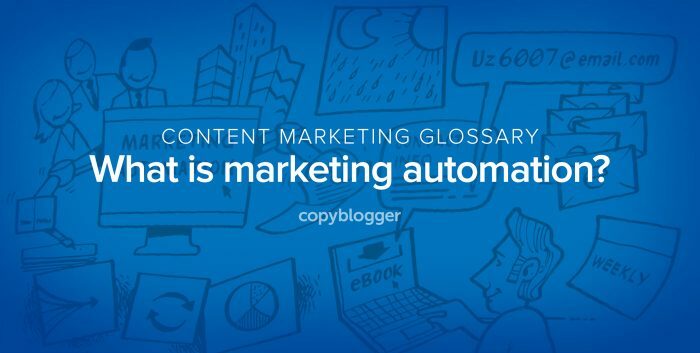 The post Marketing Automation Defined in 60 Seconds [Animated Video] appeared first on Copyblogger. $ 9 billion. That’s the amount of money spent worldwide on ebooks in 2015. $ 21.3 billion. That’s the amount of revenue from online education in the U.S. alone in 2015. And let’s not forget that mobile usage is off the charts, podcasts are growing in popularity every day, and software as a service is a new business norm. This is great news for anyone hoping to build a business around the growing market of digital commerce. But what exactly is digital commerce? Digital commerce is what happens when a buyer gives a seller a predetermined amount of money in exchange for a digital product. The seller could be a single person or a company. That’s simple enough. But what is a digital product? Think software, online training courses, ebooks, streaming media, fonts and graphics, photographs, iPhone apps, online casino tokens, desktop wallpapers, software as a service, video games, music files, and membership subscriptions. In other words, non-physical products that exist only in digital form. So, the buying and selling of these products is known as digital commerce. Once a digital product is created, set up, and proven to sell, it can become, in many ways, a passive, long-term source of profit. We’ll feature the other videos soon, but if you’d prefer not to wait, you can watch all the videos now by going directly to the Content Marketing Glossary. By the way, let us know if you have any definitions you’d like us to add to the glossary! Just drop your responses in the comments below. The post Digital Commerce Defined in 60 Seconds [Animated Video] appeared first on Copyblogger. Whoah, been a while since I’ve posted something! Yet, I wanted to mess around with some fun CSS3 stuff and wanted to share the results with you. Today, we’re going to create CSS animated profile cards. Although there are four different kind or animations (Push, Slide, 3D Flip and Explode), they all share the same kind of HTML structure. Simply hover over the images to see the contact details. The pictures used are created by Belovodchenko Anton, but their profile data is fake. -prefix-free has been used to remove the vendor prefixes in CSS. All animations are done with the help of the transition property. So, how can you create this effect for yourself? Let’s dive into the code, explaining the parts one at the time.